Recently a friend was moving and was confronted with too many boxes of books. This is something that I have come across many times as I shoehorn my modest collection of pop-ups into tiny New York apartments. In an attempt to lighten her load she offered some lovely movable titles that had belonged to her grandmother, a children’s literature professor. 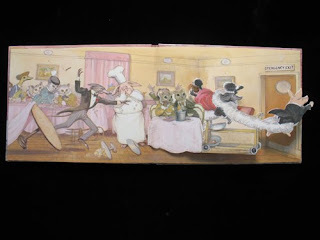 I was grateful for the kind gesture and excited to come across a pop-up book that was new to me. 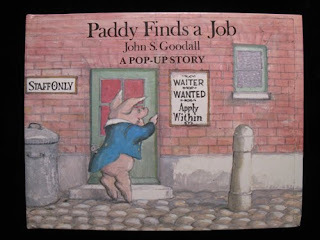 Paddy finds a job is a pop-up story created by the late John S. Goodall in 1981. The book has an Athenuem imprint logo and was printed by Intervisual with paper engineering credit going to the great Tor Lokvig. This is a six spread wordless book that tells the tale of the disastrous employment Paddy Pork who was first introduced in 1968. The folks at Intervisual stay true to Mr. Goodall’s vision and even employ the artist’s knack for using half pages to progress the action in the story. It is a charming book with subtle and efficient pop-ups but I can’t help but get hung up on a few small details. When you anthropomorphize animals, it helps to be consistent. Why is Paddy Pork the only figure that is pantless? And why is there a pet cat alongside larger feline diners? Those weaned on Disney characters like Donald Duck and the Goofy/Pluto conundrum can readily dismiss these observations but viewers still have to wonder why Paddy continues to charge out of the restaurant after tripping over the boa of the prominent poodle. 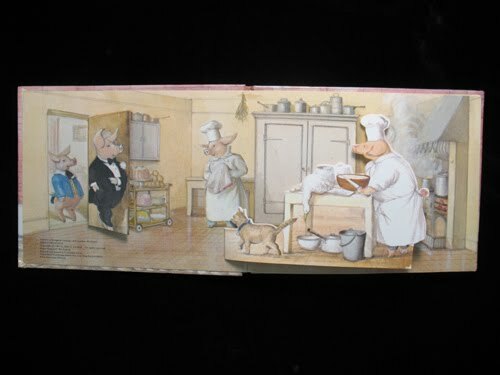 I guess we learn that nothing good comes when you put swine before pearls and vice versa. How incredibly cool, Kyle. I love your use of the term "wordless" yes! That's a term I want to steal for my work from now on. 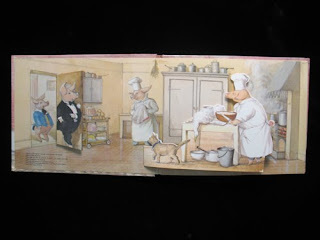 I knew the late John S Goodall well, a lovely gentle man, his illustrations spoke of a vintage and unsophisticated world. i love his Paddy Pork books, particularly the black and white ones. He was a very accomplished line artist and produced hundreds of illustrations for the 'Miss Read' series in the UK. He was a great support to me and I was deeply touched when he left me two gold rimmed champagne glasses and his actual watercolour palette in his will. His granddaughter holds the rights to all his books, which are sadly all out of print now. Thanks for the praise, Shelley and the background info, Paul. Let's hope that a new generation will get to read 'Paddy Pork'.